The type A it is a Mobil Home O'Hara, with double isolation, very comfortable and functional, with capacity for 2 people. It is compound for a living room dining room with a sofa-bed for a square, marriage room, bathroom with WC, washbasin and he/she takes a shower with hot water, he/she cooks equipped with furniture, sink, encimera and refrigerator, with external terrace, solarium and parking for a car. It has TV, microwaves, garden furniture with parasol. It is included sheets and towels and change of weekly clothes. Mobil Home A, Sleeps 2/3 - 16 m2. Bungalow B2 is of wood, and completely integrated in its surroundings, very welcoming and comfortable, sleeping two to four. It comprises a kitchen-dining room with a sofa bed for two, a double room, bathroom with toilet, basin and shower with hot and cold water. Kitchen with utensils, sink, hob and fridge, porch with outdoor terrace, sundeck and parking for one car. Offers TV, telephone, microwave, garden furniture. Includes sheets and towels, changed weekly. Any considered dangerous company animal won't be accepted and he will never be able to be alone, the corresponding supplement will be applied. No dogs from 1 to August 22. Bungalow B2, Sleeps 2/4 - 24 m2. For motor homes, caravans or family tents. Includes free WI-FI, and power connection 220 V – 5 Amp. They are located in the shaded central area and they are delimited by typical Mediterranean climate trees. Pets are not allowed in the high season (from the 1nd to the 22rd of August). Friendly campsite with top-quality facilities and a matchless safety and customer help service at your disposal. With spacious, well-defined, flat and shady pitches with electric hook-up for caravans and family tents and an area of 65 - 75 m2 in the central area. The enclosure of pools has a surface of 2000 m2 and it has 3 pools, a big of 25 x 12,50 m., another acclimatized with two jet canyons to pressure for back massage and cervical of 12,5 x 6 m. and another infantile one multicolored to splash about and to play with the water of different animals, and a solarium of 1500 surrounded m2 of plants and vegetation. The pitch Premium are of 70 m2. + Wi-FI and they are located in the central zone. For tents or caravans, flat and shaded pitches, surrounded by Mediterranean vegetation. Includes power connection 220 V – 5 Amp and optional WI-FI. Pets are not allowed in the high season (from the 1nd to the 22rd of August). 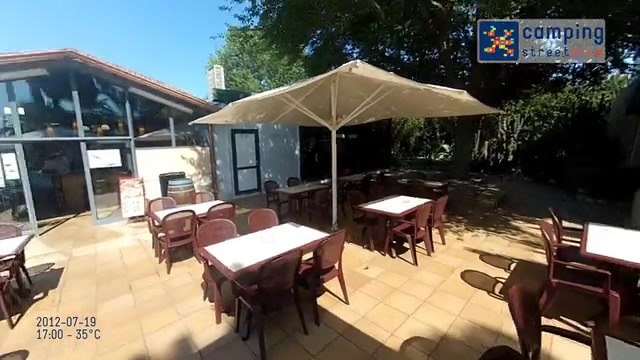 Our campsite boasts more than 1000 shady trees typical of the Mediterranean (mulberries, elms, poplars, willows, pines, olive trees, acacias, meliaceae, palms, cypresses etc.) and more than 10.000 shrubs and plants. Wide landscaped garden areas, with Mediterranean plants and a cactus and succulent plant garden. Green -in all its shades- is the predominant colour in the camping and bungalows area, providing a sensation of calmness and relaxation. The site's trees make the landscaper more friendly and stimulating. New Mobil Home family and spacious house IRM very nice and integrated into the environment, with a capacity for 4/5 people baby. It consists of 2 bedrooms, bathroom, kitchen-dining room with a sofa bed in a plaza, outdoor terrace and parking for one car. The bathroom has a washbasin and shower with hot water hair. Toilet in separate room. Fully equipped kitchen with crockery, kitchenware, hob, sink and fridge. One of the bedrooms has a double bed and the other twin beds. It also has TV, microwave and garden furniture with umbrella on the terrace. It includes bed linen and bath towels and change of weekly clothes free WiFi. The C2 is a Campitel bungalow of wood, very comfortable and practical sleeping four to five. It offers two bedrooms, bathroom, kitchen, living-dining room with a sofa bed for one, covered terrace and outdoor parking space for a car. The bathroom offers toilet, basin and shower with hot and cold running water. Kitchen equipped with crockery, pots and pans, hob, sink and fridge. One bedroom has a double bed and the other a bunk bed for two. Also offers TV, telephone, microwave and garden furniture on the terrace. Includes bedclothes and towels, changed weekly. Bungalow C2, Sleeps 4/5 - 30 m2. The type B1 is a bungalow Gitotel, integrated in the nature, very warm and comfortable, with capacity for 2/4 people. It is compound for a living room dining room with a sofa-bed for two squares, marriage room, bathroom with WC, washbasin and he/she takes a shower with hot water, he/she cooks equipped with furniture, sink, encimera and refrigerator, porch with covered terrace and external space for a car. It has TV, telephone, microwaves, garden furniture. It is included sheets and towels and change of weekly clothes. Bungalow B1, Sleeps 2/4 - 24 m2. Our C1 is a IRM bungalow of wood, very pleasant and comfortable. If offers two bedrooms, bathroom, kitchen-living room, covered terrace and outdoor parking space for a car. The bathroom offers toilet, basin and shower with hot and cold running water. Kitchen equipped with crockery, pots and pans, hob, sink and fridge. One bedroom has a double bed and the other has two simple beds. Also offers TV, microwave and garden furniture on the terrace. Includes bedclothes and towels, changed weekly + free WiFi. Bungalow C1, Sleeps 4/5 - 30 m2. For Canadian tents, cyclists, motorists or people without vehicle. They are located in the back corridors. They are very shaded and surrounded by cypress. It is a new Mobil Home house O' Hara, very comfortable and spacious with double insulation. With capacity for 4 adults + 1 child or teenager + 1 baby. It has a double room with space for a cot, a room with 2 beds, dining room with sofa bed, a bathroom, a kitchen with fridge and microwave, terrace and parking for one car. Mobile Home also has TV, WiFi and bath and bed linen. Mobil Home C20, 4/5 Pax - 30 m2.